Poems, so carefully wrought and cautiously shared, begin in our minds and are then read in the infrequent poetry gathering or more often from slim editions of books. These books quickly find their way to the furniture where the only reminder we have of their existence is a slim, quarter-inch of spine vying for our attention from the book shelf in living room or dining room. Nice, but occasionally a poem needs to be posted on a wall, it needs to jump in our face, to shout or sing its words. A broadside is the vehicle for making poetry public. A broadside is printed communication reduced to its most essential, minimal form. Before there were books, there were broadsides. A broadside is simply a single sheet of paper, printed on just one side; today, produced by photocopiers in the billions, we call them flyers. In the late middle ages stacks of these were carried about the streets by vendors in the towns and cities of Europe and sold for the smallest coin. Often posted in pubs and coffeehouses they were the most common form of public communication, predating newspapers and magazines. Interestingly, one of their most popular uses was for the sharing of poems as the lyrics to songs. With no radio or recordings, it was the only way the newest songs and ballads could be shared beyond a performance. 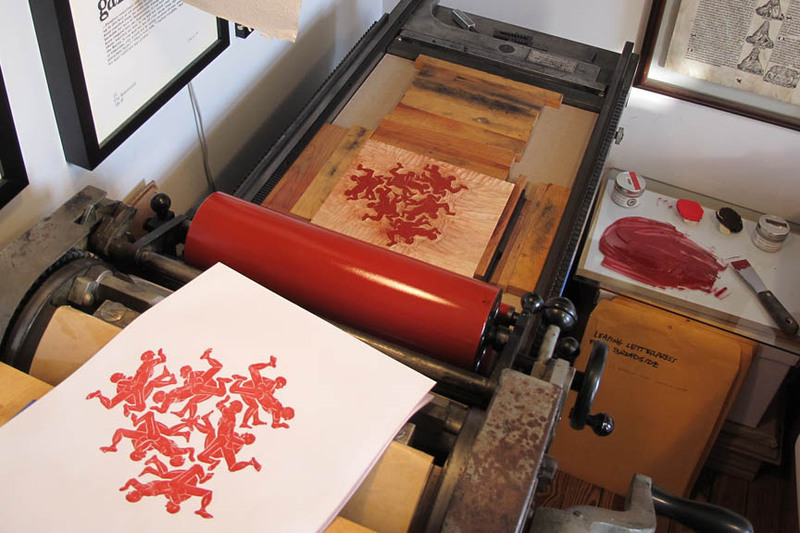 In our time, writers and artists remembering their ease of production, have found broadsides a convenient creative medium as a renewed interest in printing and especially hand printing with letterpress equipment has spread around the country. A broadside is a celebration of words! On the wall it is there for everyone to see. It can be easily replaced with another, and becomes a wonderful way to share literature with those visiting our homes and work places. It reminds us of the books we love to read. A number of years ago I started a letterpress print shop and began studying woodcut printmaking. I call my press Leaping Letterpress, after e. e. cummings poem about the “leaping greenly spirits of trees…” I love working with poets and publishers, carefully setting their words letter by letter in metal type, cutting a complimentary image in a wood block, and then printing the whole composition on a really nice sheet of paper which will be cherished by the recipient. It is a wonderful way to share the buoyant energy of a poetry reading with the audience as they leave and take home a keepsake. Printed in small editions and sold for the price of a book of poetry, they are an effective way to share and preserve the carefully crafted written word.